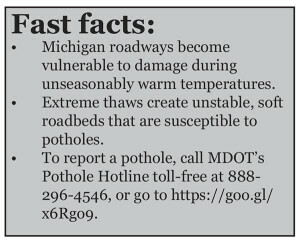 With all the freezing and thawing we have had lately, I have noticed a whole lot more potholes on the road. Some of which take my car right out of commission if I am not watching. It may be time to put some of those orange signs out that simply say CAUTION. You know another area in our lives that I have found that all of us should approach with caution is in our words and within our conversations. Do you remember the childhood saying, “Sticks and stones will break my bones, but words will never hurt me?” Of course you do. We all remember that rhyme and have more than likely said it a time or two. We use to say that in order to let bullies know they were not going to get under our skin. But in reality, that childhood rhyme is not so true. Name-calling really hurts down inside. All of us have been hurt by someone calling us names and more likly than not, we have hurt someone else with our words. We can say that little phrase all day long and to whomever we want to, but being called names really does hurt us deeply. Someone said that we should handle words carefully because they have more power than atom bombs. It’s true! When we are getting ready to say something we shouldn’t say, we need one of those big orange caution signs to pop up in our minds to help stop us or at least to help us choose our words wisely. God’s Holy Bible is the greatest book for showing us how to live a balanced life. It says, “Be quick to listen and slow to speak” (James 1:19). Can I say that again? “Be quick to listen and slow to speak.” If there were ever a bright orange sign saying CAUTION, I think that would be it. When we speak quickly, we speak dangerously, possibly hurting other people along the way. Words can be painful when spoken in anger or jealousy or fear. And the words we choose not only affects the moment, but they can have lasting affects for a lifetime. We need to choose them carefully. I have found that words are so powerful. They have the power to hurt, but they also have the power to heal. What’s the deciding factor? The choice you make. The caution you take by choosing your words. So friends, just as we have to slow down to avoid some of those potholes that are out there on the road, let’s all slow down before we respond to someone. Let’s be cautious. Let’s be careful of what we say. Let’s really listen and then choose our words wisely and lovingly. Let’s begin to heal our community and start with our words. Be extra cautious around puddles—they could be potholes filled with water. 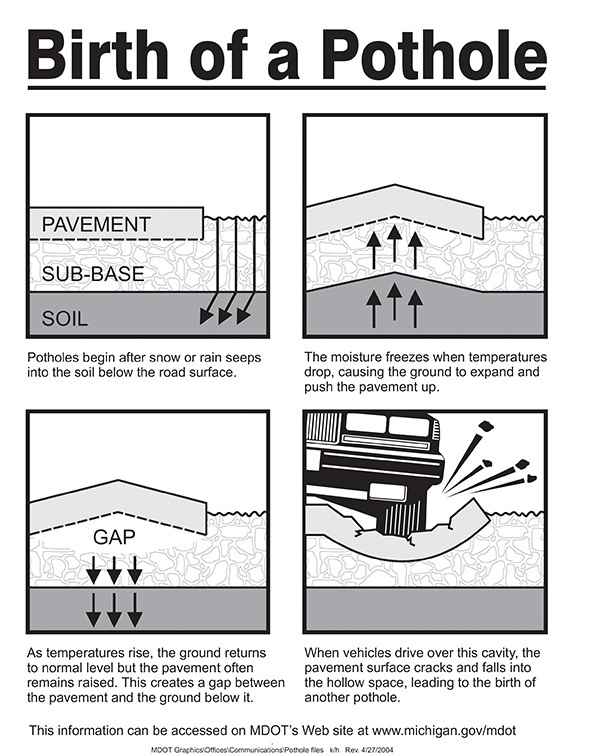 Since water is a critical component to forming potholes, that puddle may be at work creating one as you drive through it. • Make sure your tires are properly inflated. Over- or under-inflated tires fare worse when they tangle with a pothole. 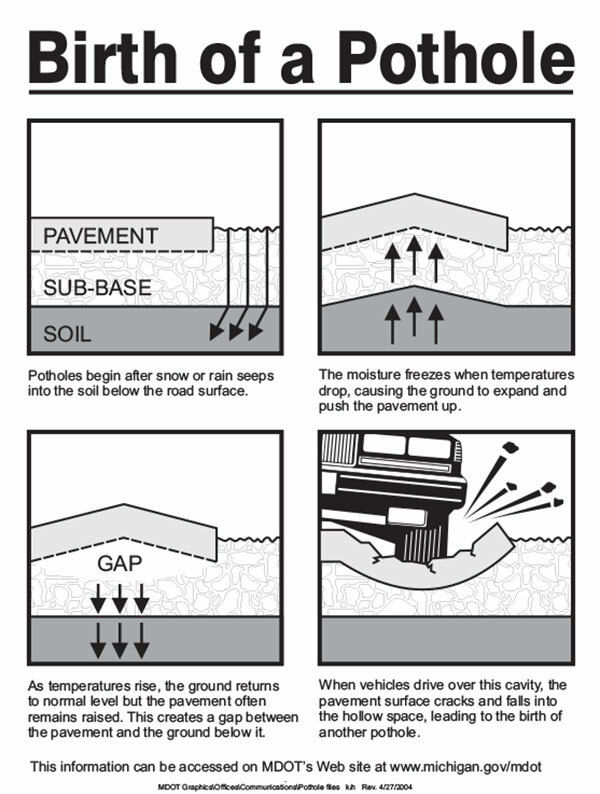 Tires showing excessive wear or bulges in the sidewalls won’t hold up as well to potholes, either. • Have your vehicle’s suspension and steering components checked out by a qualified mechanic. Steering that is in good condition and responsive can help you avoid hitting potholes. Remember that shocks, struts and springs in good shape help cushion the blow. There are often two schools of thought on driving through potholes: speeding up to “jump” over them and jamming the brakes hard to hit them as slowly as possible. Both might work occasionally but the best way is somewhere in between. If you see a pothole ahead and can’t safely steer to avoid it, it’s best to slow down, then release the brakes before you hit the pothole. This helps to reduce the speed at impact as well as give your suspension the full range of travel to absorb the impact. If you can’t avoid the pothole, straighten your wheel to hit it squarely and roll through. Hitting a pothole at an angle can transfer the energy of impact in ways more likely to damage your vehicle. Whether you hit a pothole or you missed it, you can save your fellow motorists the headache and costs of repairs by reporting it. If it’s on a city street or county road, report it to your city public works department or county road commission. 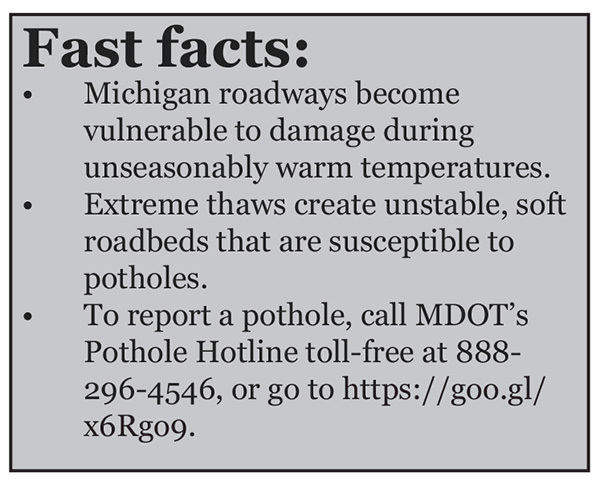 If it’s on state trunkline (I, M or US route), submit it to MDOT’s Report a Pothole webpage (find link at www.michigan.gov/mdot) or call it in to the Pothole Hotline at 888-296-4546.